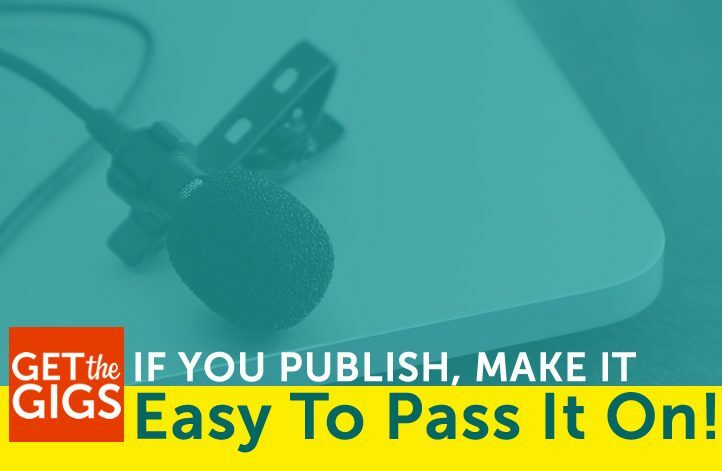 Whether it’s your blog posts, podcast episodes, videos, tutorials or your site’s images, if you want your content marketing shared you have to make it EASY! This morning I clicked a Twitter link to a great read on making the best connection with your audience while speaking. It was well-written, incredibly topical and a great fit for my social media followers and peers. Your blog post value rapidly diminishes in my eyes, and the eyes of anyone who calls him/herself a content marketer, when you make it appear you never want anyone else to set eyes on the flipping thing! Content Marketing = Publish + Promote! Guess what guys and gals? While it’s very important to create killer content, if that’s all you’re doing, you’re missing out on rather a lot of the content marketing machine. It’s not Field of Dreams! If you publish … there’s no guarantee the hordes will come. If someone besides your spouse, besides your mother, comes across your killer content, wouldn’t it be wise to make it easy for them to share it far and wide?!?! You have NO sharing buttons whatsoever! People have to log-in to a third party app in order to share. Your video has no synopsis to hint at what it’s actually about. Your Twitter handle isn’t automatically populated when people click your Twitter sharing button. Your gorgeous pin-worthy image has NO description. Your visuals are tiny and poorly designed. Your type is so small no one wants to pull out their reading glasses to see if the words or worthy of sharing. Your oh-so-clickable title has NOTHING to do with the actual meat of your publish. I could go on and on, and I probably have in the past! I’m Keeping This Short, Sweet & Share Ready! Content marketing involves a whole lot more than the creation of the content you intend to market. Clicking publish and sitting around hoping someone finds it is simply creating content, sans the marketing that rounds out the activity. Don’t expect your readers to do the heavy lifting when it comes to the marketing of your carefully crafted content. If it’s that good, a few readers might go the extra mile to ensure the word is spread. But if your reader’s in a rush or having a hectic day, they might not be so ready to exert the extra effort. So do it right and make sharing easy! It will make your content marketing efforts easier in the long run!